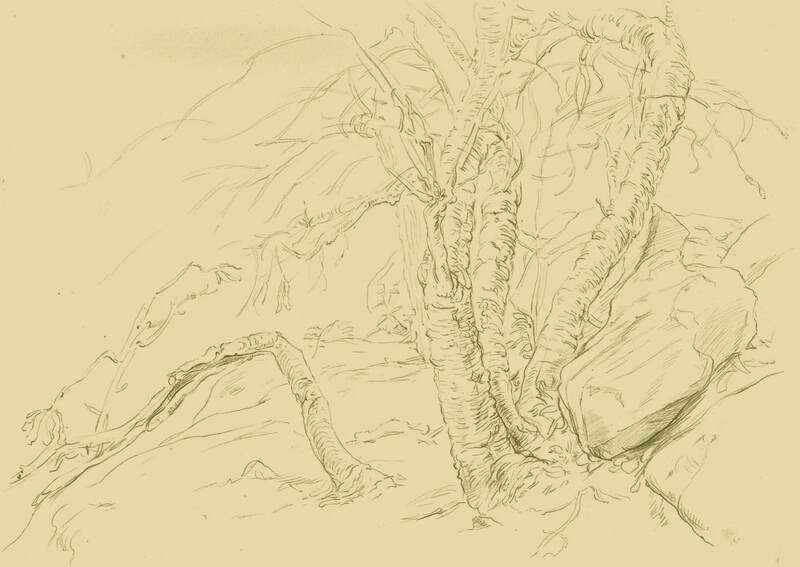 This course looks at how the drawing conventions of European Old Master landscape painters can be employed within a contemporary drawing practice. Each afternoon we will make a field trip to the Royal Botanic Gardens, where students will make use of copies and derivative drawings they produced earlier to create a comparative living example of the plant or vista studied in class. Each WEA class will begin with a fifteen minute introductory lecture on the artist, focusing on their skill and practice as a landscape draughtsman. This short presentation will incorporate open discussion and an opportunity to raise stylistic, technical and historically related questions. For classes held at the Botannical Gardens, please ensure you arrive 15 minutes prior to the class time start. Saturday Morning – Claude Lorrain, A View with Three Pines, 1640: Students will attempt to copy in pencil Claude Lorrain’s drawing of three pine trees. They will note how pure line is used to suggest overarching form, the fall of light and shade, the ephemeral appearance of foliage and the texture of trunks. Saturday Afternoon – Botanic Gardens: Location within the Botanic Gardens to be anounced. Sunday Morning – Pietro Testa, Landscape: Another small grouping of trees will be analysed in the context of a more complex receding setting. In this study we will introduce pen and ink over an initial light pencil drawing. Sunday Afternoon – Botanic Gardens: Location within the Botanic Gardens to be anounced. Learn to borrow and develop the shorthand means necessary for describing complex and ephemeral natural forms. Begin to be able to describe the natural environment with a considered use of contour, line and ink washes. Make practical use of art history within the context of historical drawings, western landscape conventions and the artificial layout and setting of the Botanic Gardens. A solid board to rest and clip your sketchbook onto in the Botanic Gardens.